Plus, I was lucky enough to have a friend driving by Rochefort the other day, so he stopped off and picked up some of the 6 for me. Good thing, too. Rochefort 6 seems relatively hard -- or expensive -- to get here in Brussels. Easy to find the Rochefort 8 and Rochefort 10 at reasonable prices in the supermarkets and pubs of our neighbourhood, but the 6 is rarer. So far, I’ve only ever seen the 6 in the specialty beer shops, which are too expensive, really. Anyway, he brought me 14 bottles of 6 and a glass from Rochefort direct. Cheers, Nadim! Before I open the bottle, can I just put in a word for the cap? 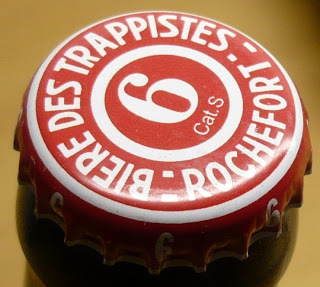 All the Rochefort beers have cool caps, but the red 6 is particularly ace. Can a person have a favourite bottle cap? OK, enough philosophy. On to the tasting. It’s slightly fizzier than I remember, but all the flavours are there: raspberry and chocolate in a combination reminiscent of the red coeurs from Belgian chocolatier Wittamer. The alcohol, 7.5%, sits perfectly with the other flavours. I’m still on the look-out for Michael Jackson’s “Darjeeling tea”, but I just can’t taste it. Maybe I’ll find it in the second bottle. I'm not a fan of trappist dubbles, haven't had any yet that was worth the money I paid for it. Will check this one out if I find it. 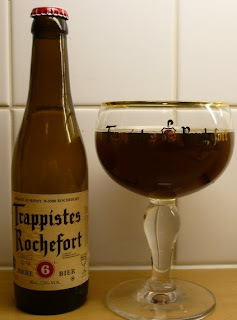 It's really an informative and well described post regarding Belgian beer. It has a great fame. I appreciate your topic for blogging. Thanks for sharing such a useful post.